The National Geographic Bowers Illuminated Desk Globe is named after Scottish explorer Henry Robertson Bowers. The acrylic globe ball features raised relief, colorful political borders and blue oceans. It's mounted on a satin nickel semi-meridian and base. Simply tap the globe to activate the 10 LED lights. Powered by four AA batteries; includes auto shut-off. 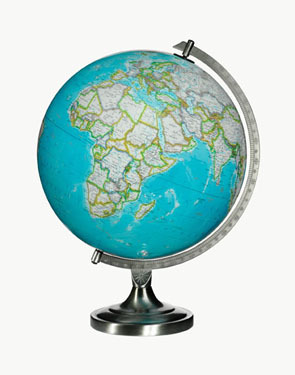 The Bowers Illuminated Desk Globe is backed by a one year warranty.